Rents for market rate units starting at $900/month. Enjoy the shopping, dining and entertainment of downtown Northampton. Conveniently located on the Manhan bike path and across Pleasant Street from the Northampton Amtrak platform. PVTA bus service to Leeds, Williamsburg, Easthampton and Holyoke is available on Pleasant Street in front of Live 155. It’s a short walk to bus service to Hadley, Amherst and the University of Massachusetts, as well as to Peter Pan bus service to Springfield, Hartford, Boston and New York City. 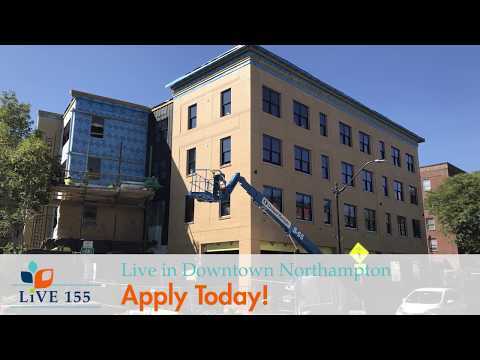 Interested in an apartment at Live 155? Live 155 consists of 23 Market Rate and 47 subsidized units. The subsidized units are rented to individuals and families at or below 60% Area Median Income. If you think you qualify for a subsidized unit, please complete and return an affordable unit application. If you do not qualify for a subsidized unit, please complete and return a market rate application.